Hey guys! It’s been a little while since I’ve been able to visit this little corner of the internet but I am happy to be back! This past week has been pure craziness: final exams, family visits, graduation, moving home, and on top of that today was the first day of my internship! Whew. No rest for the weary right? That’s okay, they’re all pretty wonderful things so I have no room to complain. During my last week in Boone, I made it a point to get to all my favorite restaurants for one last meal before moving back to Raleigh. 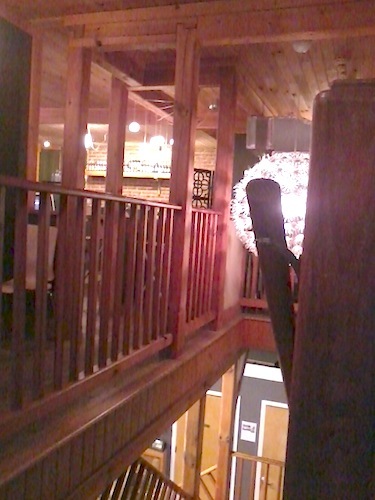 Boone has the BEST restaurants and Raleigh, despite having some decent restaurants, is mostly full of chains, blech. So I had some pretty spectacular meals this past week. 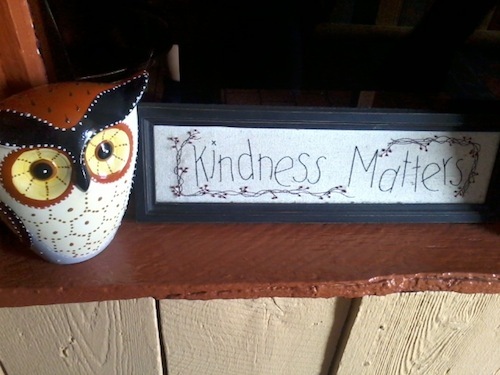 I made a roommate breakfast date at Melanie’s, an adorable little breakfast/lunch place in downtown Boone for Tuesday morning. We all had the morning off for exams and everyone knows a delicious, hearty breakfast is the best final-exam-taking fuel. 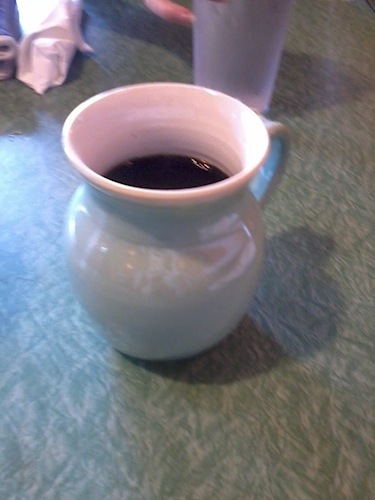 I started with a very necessary cup of coffee. It’s a little blurry, but that’s what happens when I don’t have caffeine in me. It’s not a good time. 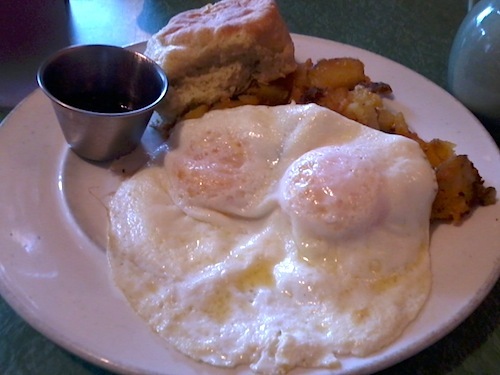 Which came with two eggs (over easy), stewed apples (un-pictured on the side), a biscuit (which I gave away to my roommates) and homefries. I have a new found homefry obsession and have been ordering every where. Maybe not the healthiest obsession but dang delicious. This meal kept me full for 6 whole hours which is a pretty big feat for me. 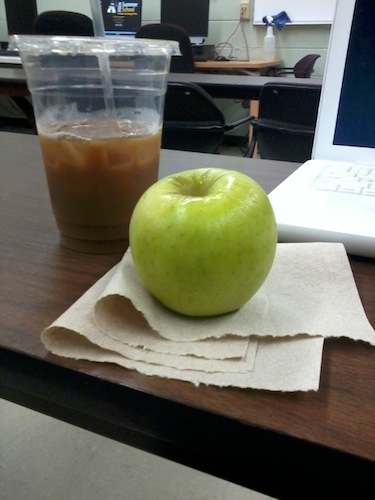 Thursday afternoon I grabbed an iced coffee pre-exam and a farmer’s market apple. This is the first time I’ve put milk in my coffee in FOREVER. Iced coffee is a little rough on my stomach, probably because I drink it 10x faster than hot coffee, but a little bit of milk seems to help. 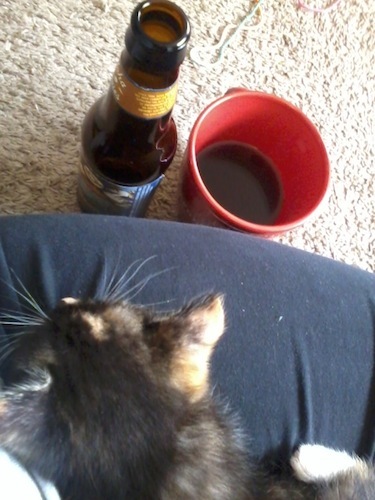 Beer, coffee, and a kitty in my lap. Could life be better? I got one last visit in with the kittens before they left for Michigan, it’s amazing how much they’ve grown in 2 weeks! Dinner was good old Black Cat. 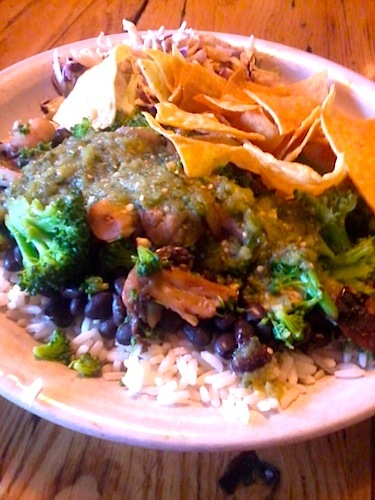 I built my own burrito with black beans, rice, broccoli, mushrooms and tomatillo salsa, minus the tortilla. 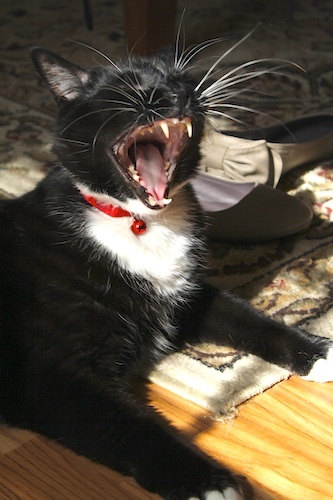 Oh Black Cat, I’m going to miss you so much. After dinner one of my roommates and I headed to Low Wine Bar. It’s located on top of Espresso News, the best coffee shop in Boone. This was my first time going and I’m not sure why I waited so long because it was awesome. Whoever decided to put a coffee shop and wine bar in the same building is a GENIUS. 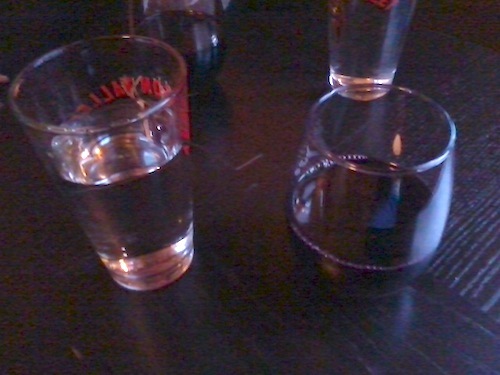 I had the Marc Roman Malbec, mostly because it was the cheapest red on the menu, but it also happened to be really tasty. Really easy to drink without being too sweet. Post-wine my roommate and I spilt a 7 Layer Bar from the coffee shop downstairs (genius, I’m telling you). It was not even close to gluten-free but so tasty it was completely worth it. 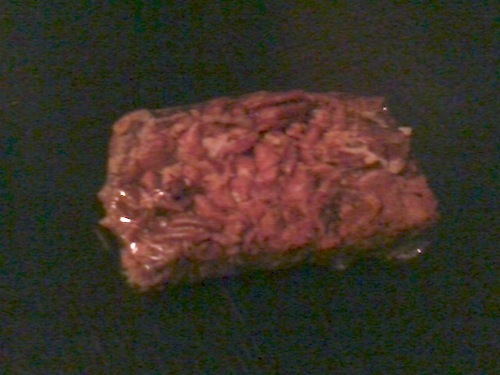 7 layer bars are the best. Saturday afternoon my parents and boyfriends drove up to Boone for graduation festivities. They didn’t get into town until around 1:30 and I was starting to get borderline hangry. It happens. Luckily I had this amazing and filling meal from Coyote Kitchen to tame the hunger beast. 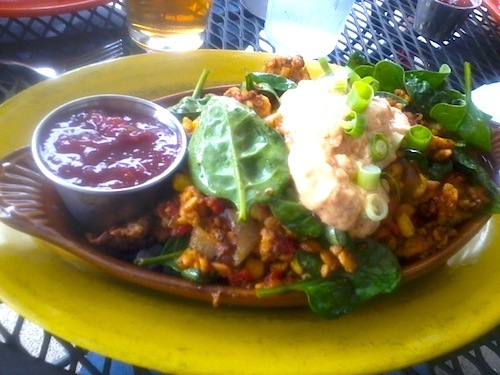 I had the Sedona Boat: Coconut rice, black beans, blackened tempeh, roasted sweet potatoes, corn, caramelized onions, roasted red peppers, and spinach, topped with sweet red vegan mayo and scallions. I was full beyond belief after finishing this bad boy but it was soooo worth it. It took me way too long to decide what I was going to order, I’m not used to having so many options – it’s hard to decide! 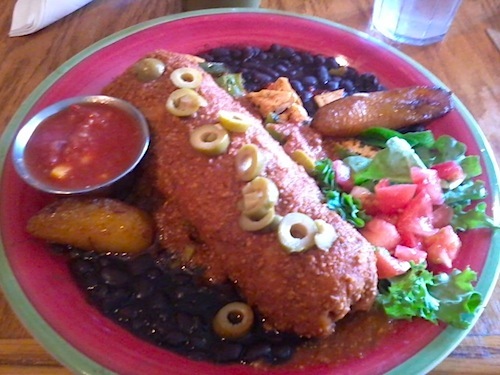 But I finally decided on the Tamale De Bayamo: House made tamale filled w/ spinach, squash, yams, garlic, corn & peppers. 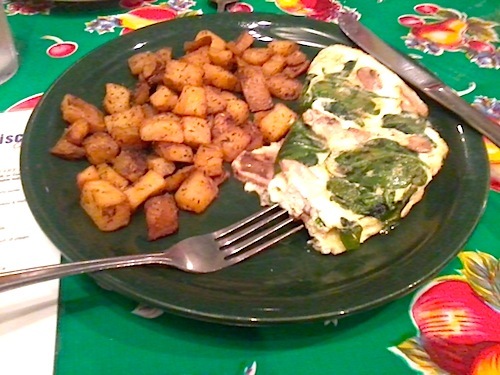 Served w/ tamale sauce, black beans, plantains, chipotle queso salsa, green olives, romas & spring mix. Post-graduation we hit up somewhere low-key for dinner. We didn’t want to deal with the post-graduation dinner rush, especially with 7 people. Black Cat again! Twice in one week? I’m not upset about it. I had the (blurry) Satay it to Me Softly (how cool are the burrito names? 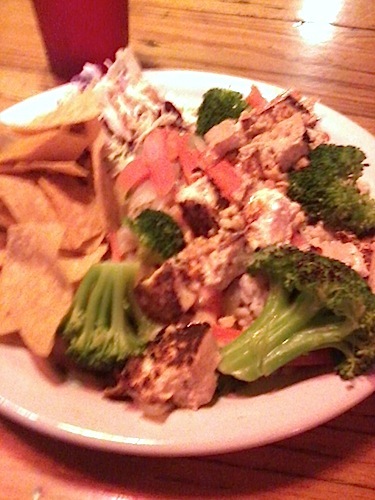 ): rice, tofu, carrots, broccoli, caramelized onions, and a spicy peanut sauce. Delicious as always. 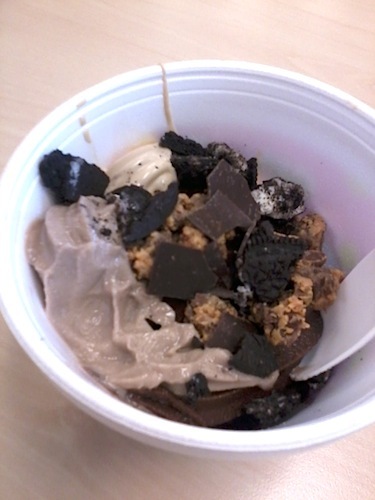 Fro yo! Chocolate and Reese’s peanut butter yogurt topped with more Reese’s, chocolate shavings and Oreo’s (they are my gluten nemesis!). This was the most perfect fro yo cup I could have asked for and I enjoyed every last bite! I have no pictures from Monday (sowwy!) but I have to mention the delicious meal I had at Boone Bagelry. The meal itself was pretty basic but really delicious. I had two eggs (over medium, is it sad I didn’t even realize this was an option until this week? 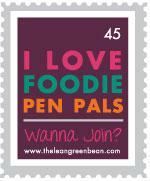 ), homefriends (I’m telling you, I’m obsessed!) and a gluten-free whole grain bagel. Yup, a gluten-free bagel! I should have taken more advantage of it this year! I’m kicking myself now. Then I loaded up on old school candy at the Mast General Store. The sugar was more than necessary for the 3+ hour ride home. Why have I not eaten more MalloCups in my life? They’re delicious! Today was my first day at my internship! Everything went really well and it looks like it is going to be a busy, but very fun time! I also found out there is a Whole Foods less than a block away from my internship. This is going to be very dangerous for my wallet. 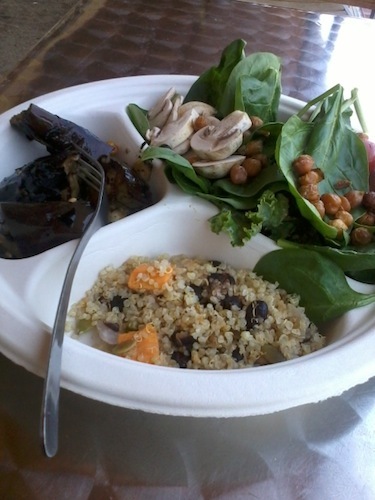 Salad with spinach, garlicky kale, cherry tomatoes, mushrooms and roasted chickpeas, roasted zucchini and eggplant (which was served cold, I wasn’t a fan) and some kind of quinoa dish with sweet potatoes, black beans and pepitas. I also had an un-pictured Clif Builder Bar on the side. After writing this I’m hungry all over again. Does your town have an delicious/unique restaurants? What’s your favorite hat/salad bar meal? The Gobbler 5K was actually on December 1, which makes this post only 2.5 weeks late. Whoops, I guess I’m a little bit of a procrastinator. Sowwy. The race started bright and early at 8:30, one day I’ll learn to stop planning things on Saturday mornings and actually sleep in. One day. It was a pretty chilly morning but not too terrible for December in the mountains, I hate running in the cold and my feet and hands were a little frozen at the start of the race, but they thawed out some after a few minutes. 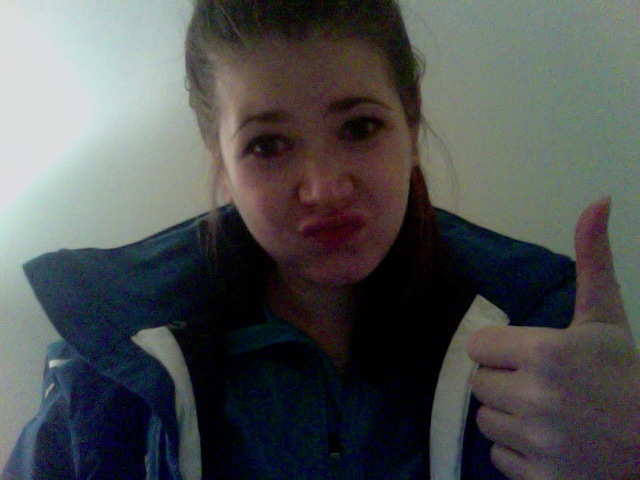 The cold air was a little rough on my lungs but I was feeling pretty good otherwise. The course kinda sucked because it started with a sharp right turn and we had to stick to the sidewalks. That’s my one pet peeve about Boone races, there are only so many (relatively) flat running paths in the city and most are main roads so they can’t be shut down, which is understandable but starting 260 people on a sidewalk creates some really frustrating congestion. There was also one KILLER hill about 2 miles in, we actually ran down that hill last year so it was a little mean to reverse the course and make us run up it this year. I told myself it didn’t matter how much I slowed down as I tackled that best, but I was not allowed to walk, once I start walking I lose momentum and I struggle to get it back, luckily I was all to power through and I took that hill down. I finished in 31:30 which was actually probably closer to 31:00 since I started way back in the crowd at the starting line. Definitely not a PR, but I wasn’t expecting it to be and I’m pretty happy with 31:00. Last year I finished in just shy of 37 minutes, that means I’ve dropped 6 minutes off my time in the past year and I think that’s something to be pretty proud of. Sometimes I have a bad run and get a little down on myself and then I remember a year and a half ago I couldn’t even consistently run a full mile, and since then I’ve run numerous 5K’s, an 8K, and a 10K and that’s something to be proud of. Not to mention last year I’m pretty sure I would have never made it up that hill! 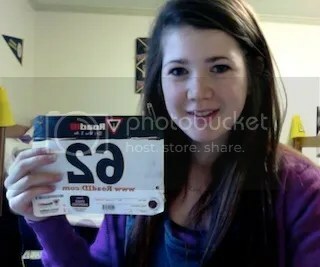 I’m never going to be the fastest runner and I may never place in a race but I’m completely okay with that. Running is a constant challenge for me and something that has never come easily for me, but that’s one of the reasons why I love it. With every milestone I reach and every second I knock off my PR, or every step I add to my PDR I’m filled with an immense sense of pride with what my body can do. And I hope that my running continues to grow in the next year. Oh and I forgot to mention the best part about The Gobbler is the cobbler at the finish line. They even had gluten-free! I enjoyed a bowl of blackberry gluten-free cobbler and it was really delicious. Definitely a winner as far as finish line foods go! What’s the best finish line food you’ve seen? I think the cobbler wins that one, but the Stickboy goodies at the Mayview Madness 5K were a close second!